Stephen Fitzgerald AO joined the Founding National Male Champions of Change group in 2010. Stephen is Chairman and Founding Partner of Affirmative Investment Management, the world’s first dedicated green and impact bond fund management company. 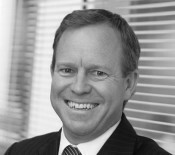 Stephen serves on the boards of QBE Insurance Group (Global), the Great Barrier Reef Foundation (Australia) and the British Museum Investment Sub Committee (UK). He is a member of the NSW Government Expert Advisory Panel on Social Impact Bonds (Australia). Stephen was appointed as a member of the Board of Guardians of the Future Fund (Australia’s Sovereign Wealth Fund) and served for a period of five years until April 2016. Previously, Stephen was Chairman of Goldman Sachs, Australia and New Zealand. He joined Goldman Sachs in 1992 and was named a Managing Director in 1998 and a Partner in 2002. In his time with Goldman Sachs he served on the GS Partnership Committee, the European Management Committee and the Asia Pacific Management Committee and has been based in London, Tokyo, Hong Kong and Sydney with Goldman Sachs. Stephen earned a Bachelor of Economics degree from the University of New England, Australia in 1986.